The Chachapoyan Fertility Idol was a solid gold statue, six inches tall, representing Pachamama, the Chachapoyan goddess of fertility. The idol was hidden by the tribe's priests in a temple deep within the jungles of Peru. Braving the temple's deadly traps to stare into the idol's eyes became a rite of passage for young Chachapoyan warriors. A Princeton Archaeologist named Forrestal disappeared in the jungles of Peru while attempting to recover the Fertility Idol of Pachamama from the Temple of the Chachapoyan Warriors in Chachapoyas in 1935. In 1936, Indiana Jones, on commission from the National Museum and working from Forrestal's notes, managed to locate the temple and extract the statue, only to have it immediately stolen by rogue archaeologist René Emile Belloq. Belloq promptly unloaded the artifact in Marrakesh, where Jones later re-appropriated it from the shop of antiquities dealer Saad Hassim. 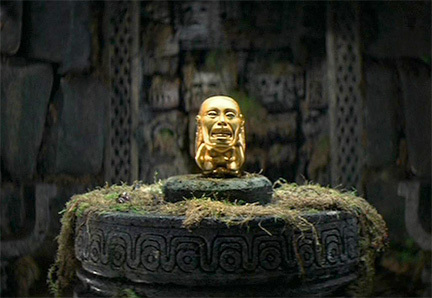 Behind the scenes : In Raiders of the Lost Ark, the original idea for the scenes with the idol was to have its eyes following Indiana Jones as he moved around the room. As such, one of the props built featured mechanical moving eyes. Evidence of this can still be seen in the archival footage on the film's DVD. Ultimately, the idea was abandoned though one shot remains in the final film -- the one where Indy is pouring sand out of the bag.